Volkswagen is testing prototype self-driving cars in Hamburg, Germany. The automaker claims these are the first tests of autonomous cars in a major German city. The tests will help ongoing research projects into autonomous driving, a VW press release said. The test fleet consists of five modified Volkswagen e-Golf electric cars. Similar to test vehicles operated by the likes of Waymo, the e-Golfs are festooned with sensors that allow them to navigate city streets. Each car has 14 cameras, seven radar units, and 11 laser scanners, according to VW. Those sensors generate up to 5.0 gigabytes of data per minute, which is processed by computers in the trunk. The computing power of each car is equivalent to 15 laptops, Volkswagen said. A human safety driver will be on board at all times as a backup. Consequently, VW noted that its test vehicles register at Level 4 on the SAE autonomy scale. The automaker said its ultimate goal is to develop cars capable of Level 5 driving. The highest level on the scale, it signifies cars that drive themselves at all times, and don’t have steering wheels or pedals. Reaching Level 5 will require significant changes in regulations, Volkswagen said. The self-driving car tests are part of a larger effort by VW and Hamburg’s government to demonstrate new technologies. 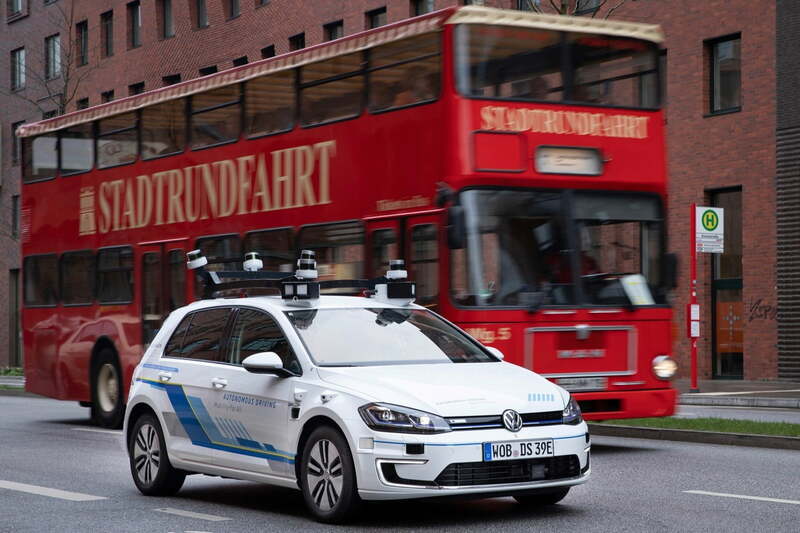 A 9-kilometer (5.5-mile) “digital testbed for automated and connected driving” is currently under construction, Volkswagen said, with completion scheduled for 2020. This will include upgrading of traffic lights with vehicle-to-infrastructure (V2I) communication tech that allows them to “talk” to cars. VW isn’t the only automaker that’s busy developing autonomous cars. Ford plans to put a self-driving car into production in 2021, while GM will double the size of its Cruise division as it preps to commercialize the tech. Other automakers, such as Toyota, Nissan, and Mercedes-Benz, are testing self-driving cars as well. They’re competing with a number of tech companies and startups to take autonomous driving mainstream. But, in the United States at least, the public remains skeptical of self-driving cars. Overcoming that ingrained skepticism may be as much of a challenge as getting cars to drive themselves in the first place.